On Friday night, the WWE celebrated the 2017 class of WWE Hall of Fame inductees. The newest members of the WWE Hall of Fame inducted this past weekend in Orlando, Florida include Kurt Angle, Diamond Dallas Page, Ravishing Rick Rude, Beth Phoenix, Teddy Long and The Rock 'n' Roll Express. To commemorate these WWE Superstars’ enshrinement in the HOF, the WWE has released this awesome new collection of six retro t-shirts – one for each member of the class of 2017. 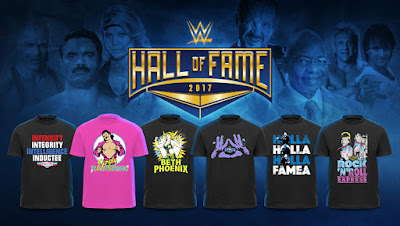 Each of the WWE Hall of Fame 2017 T-Shirts seen here is available now at the WWE online store in sizes S-3XL for $24.99 each.